The second event on our Ladies of Leisure calendar was the much-anticipated grand opening of West Elm in Orange County’s posh South Coast Plaza. In fact, it was adjacent to the first event. 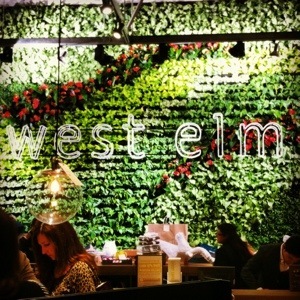 The West Elm store is absolutely amazing – check out this awesome living wall that greets you when you walk in…stunning! Mrs. Mercado and I took a leisurely stroll around the store, stopping to gawk about every 3.5 seconds at something we’d tell a store attendant to add to our tab if we were true ladies of leisure (humor us, will ya?). I say, it’s quite a fun dialogue to hear us perusing the shelves, convincing each other that mauvish purple is a color all-too-often overlooked and such a color really makes a feminine statement when accenting a masculine brown leather couch, and don’t forget to gently lay a faux-fur throw on that couch while you’re at it – adds a bit of cozy but chic playfulness, don’t you think? Also, did you know that steel blue gray is the new neutral? You would if you would’ve been eavesdropping in our conversations throughout the night. So take note: anything you want to buy in a steel blue or grey now has our stamp of approval for purchase including this rug (which actually is really nice and sort of muted so it would be easy to change up the furniture and throw pillows around it) or this grayish (though it looked like a steel blue in store) glider and ottoman (even if you don’t have a baby! because, you know, you might someday and then it would come in really handy to have this glider and ottoman in a fabric that’s posh but casual and it wouldn’t matter if this hypotethical someday baby was a boy or a girl because it’s such a neutral color it could go with anything.) See, it’s practically in your online shopping cart already, right?! My favorite thing about the event was probably the super simple, chic libation served as a signature drink for the night: a Moscow Mule made with Bundaberg Ginger Beer, vodka and a lime. Uh-mazing! Bundaberg Ginger Beer is one of my favorite non-alcoholic drinks and I’d never thought to add some vodka to it (silly me! ), although I do know our good friend Cappy loves his ginger ale with tequila (smart man). I’m definitely thinking I need to stock our bar area with a bottle of vodka for nights when the wine just won’t cut it. 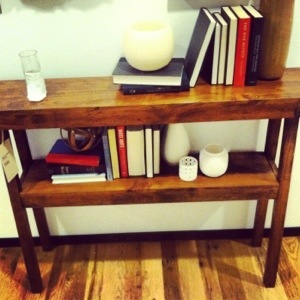 And speaking of bar shelves, have you seen my new bar cart/console table (former vanity) find from Goodwill? A torturously long line at the end of the grand opening evening gave all of us partygoers a good 20-30 minutes of standing around contemplating how much lighter our bank accounts would be if we gobbled up everything we were eyeing in the store…I’m talking about furniture but I should also point out that as far as gobbling goes, the food at the event was superb. And served by extremely good looking men (and women) if we may say so ourselves. Seriously. It was starting to get embarrassing as we tried to catch the eyes of the cater staff to mosey on over with their trays (West Elm, of course). Luckily, jaw dropping at their good looks was a bit masked by stuffing our faces with food. Hey, we’re married anyway. When Mrs. Mercado asked me at the end of the party what I’d like most having seen everything in the store, I responded: a bigger house! But, if there’s one item I keep dreaming of buying it would definitely be this. 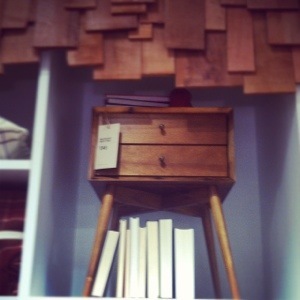 Is there anything on your wish list from West Elm? 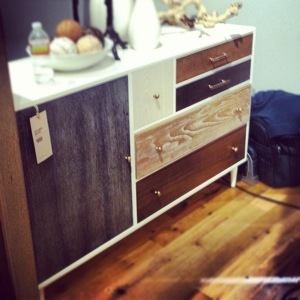 Have you been to the new store in Orange County?